SCION produced a log price outlook in February and again in May. This outlook was based on a summary of combined views from a range of people inside New Zealand and abroad. In February the outlook predicted that prices were going to drop towards May and will then return to higher levels thereafter. Although the trend was in the right direction, prices dropped more severely than expected. In May the new outlook predicted that prices were going to rise steadily, which has been the case since. Coincidentally, in both the months during which log price outlooks were generated, the price also swung around into a different direction. In both cases the outlook anticipated these changes. The figure below illustrates the forecast log prices issued in February and in May, as well as the real values that followed. The log price outlook will be repeated in August and anybody who is interested in this is now encouraged to participate in this month’s survey. The survey takes only a few minutes to complete, is completely confidential and in return participants will receive an updated forecast in early September. This month’s survey also includes pruned log prices. 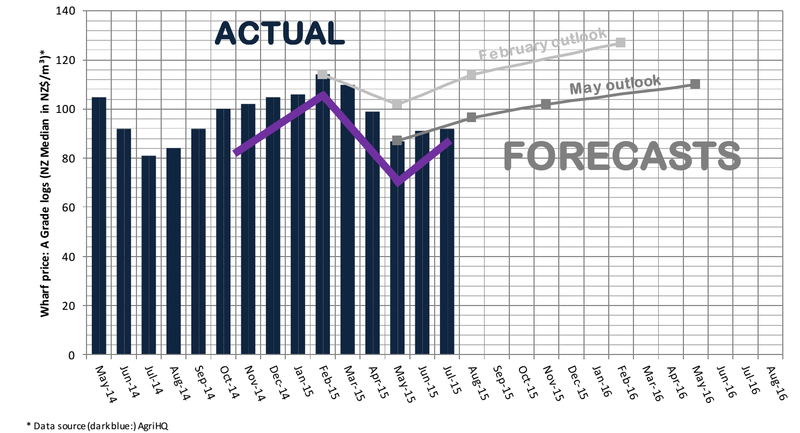 Figure: Log price outlooks in February and May (grey lines) could manage to predict the general direction of log prices at the wharf with a reasonable degree of accuracy.